I am often astounded by the hours that other bloggers out there keep on a consistent basis. Many of these authors are trying to get ahead of the game, and are aggressive in their day jobs and/or have young families. This results in them often coping with six hours of sleep or less. This is definitely one of my weaknesses as a human being. I never sleep past 8 AM, but I do need my rest to be at anywhere near full capacity. I function best if I’m in bed by 11 PM, then up again in 7-8 hours. If I get below 7 hours of sleep my productivity drops dramatically. All this to say, my job gives me several advantages as a blogger that I am happy to exploit. Before I go in-depth about why teaching is such a great job if you want to start a side gig, I should mention that all of my statistics are specific to Canada. There are slight differences across provinces, but overall, we are pretty equal. This is not so for the USA and other places. Many of my friends that teach in the States make much less than I do, and this would obviously make the job slightly less appealing (most teachers don’t do for it for the money, but I wouldn’t do it for free either). There is considerable debate about how much teachers should get paid. I know that my union is absolutely relentless in pushing our agenda. Some believe that our job is extraordinarily important and that we should be paid more than we currently do, while others believe that we are merely babysitters who get 3 months a year off. The truth is probably somewhere in the middle. I honestly believe I get paid very well for what I do, and there are probably not many people that can say that about their job. In order to pursue a side gig, like starting an online business, it is very nice to have a stable safety net. My job is the definition of that. In my permanent teaching position, my job security (thanks to the aforementioned ultra-strong union) is unparalleled. I started at around 50K last year, and my raises are locked in over a 10 year period. In Manitoba, most teachers “max out” at around 80K a year, and we ensure that we stay very close to inflationary numbers in terms of raises (if not higher) whenever our contract comes up. The financial-related benefits in teaching are worth mentioning as well. Sure there is the pension, but as I’ve mentioned before, that isn’t as great as some believe it to be. Most investors could easily replicate the process if they merely had the discipline. The real savings come in the form of large group life insurance, health care plans, dental insurance, and other negotiated benefits that are often subsidized heavily by the provincial government and/or administered by our union. This keeps costs low, benefits high, and most of all, it saves copious amounts of time in terms of comparing rates. I realize that I am very fortunate to have this low maintenance security and stability. It allows me to not only focus more on my teaching career, but also on a side gig without those distractions. So How Hard Do Teachers Really Work? There are not many more controversial questions out there than asking how hard teachers work. It is worth considering when you look at the careers that other side gig operators have. Here is the answer I usually give to people when the question is posed to me: Good teachers are probably worth well over 100K a year. They inspire people, make a huge difference in lives, and generally improve society in all kinds of ways that would be shocking if you could quantify them into dollar signs. Bad teachers probably deserve close to minimum wage. Many do literally no prep work, give out high grades to prevent parent complaints, and generally just fly under the radar. Most teachers are somewhere between those two extremes, but since we seem hell-bent on fighting any form of merit pay, this is the reality of the situation. The typical teacher’s schedule is very cyclical. There are a few days a month where I do get out of the building before 4 o’clock. There are several weeks during the year when report cards are due and/or I’m coaching sports teams, that I easily put in 70 hours. I personally prefer to get into class early, and I’m almost always at school an hour before my students, but then again, I know many teachers that aren’t. The bottom line is that teaching allows me to have huge chunks of time off. 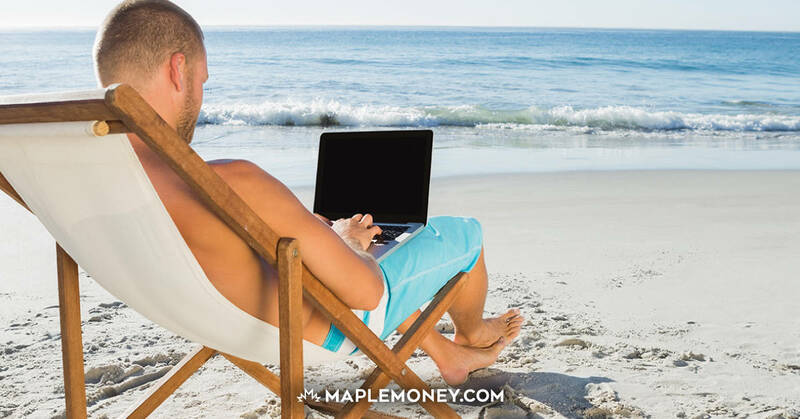 A two month summer vacation, a week-long spring break, over two weeks at Christmas, and several long weekends a year, are invaluable to someone starting their own business, especially an online one. Right now for example I am blogging to save my life and don’t have many reserve posts, but with spring break coming up I hope to be able to stockpile enough posts to get me to summer. The teacher’s summer vacation is an entrepreneur’s dream. Two months of funded freedom to pursue your own ambitions. Can’t beat that. If a teacher has a permanent contract within a school division, they can usually be easily accommodated if they want to scale back their hours. It is a little more difficult if you want to take on more working time, but if you’re patient and willing to be flexible in the courses you want to teach, this is usually able to be accommodated as well. If I ever get to the point where my side gig makes me a ton of money, I would definitely consider going half-time. The other neat thing that most school divisions now have, is an administrated year off (sabbatical). If you choose, the school division will automatically deduct a pre-determined amount of your wage from your paycheck and then pay it back to you as you take one year off to “re-charge your batteries” or start a side gig! This is actually interesting from a tax-savings perspective as well. I know many teachers out there are going to jump all over me for saying that educators aren’t the most hard done by bunch around, but we have it pretty sweet (in Canada anyway). Even those of us that put in extra hours are amply rewarded for it, and the flexibility we have on both a daily, and a career basis enables us to build a schedule largely around our side gigs. When I compare it to the schedules many of my blogging friends keep, there really is no comparison. I hear your teaching passion coming through, and for that I commend you. Having watched my son go through the Ontario public system right through to graduation, I feel qualified to offer my opinion too. There just aren’t that many teachers who teach to inspire. The majority of teachers fall into your category of ” bad teachers” who should earn minimum wage. I’ve watched countless cycles of brand new enthusiastic teachers, which over a couple years takes a turn to doing the minimum. The difference between public/private enterprise, and unions, is that workers have to constantly and consistently put forth best effort in all things, at all times. Union workers often allow themselves to be less than they can be, simply because their jobs and wages are protected. Having offered my criticism, and thank you for the forum to do so, I also will say that there have been a handful of fanastic teachers in my son’s life, those who strove to reach their students, motivate, inspire. I encourage you, TeacherMan, to be one of those. If you can make a difference to even a few students, it’s very worthwhile. Good luck! Thanks for the well-written response Ramona! I too have seen so many new teachers quickly burn out and either leave the profession or stick around for the wrong reasons. I’m still not sure why this is. Maybe it’s unreasonable expectations, or a lack of support? Thank you for your words of encouragement, I’ll do my best to live up to your standards! It is indeed a great gig. Education is an industry whose productivity hasn’t improved since Victorian times. A worker can still serve no more than 30 customers a year. Yet real incomes have soared. This is entirely due to inelastic demand. I’d argue that it’s an effective price floor imposed by unions. The price floor explains the extraordinary excess in the labour supply of teachers. Every year Ontario graduates thousands upon thousands more teachers than will ever be gainfully employed in the field. The extremely above-market wages/benefits turns the education labour field into a lottery economy. Extremely tough to get a permanent job but when you do, you strike the jackpot. Thus, many more people try than will ever succeed. I don’t think a lottery economy is particularly efficient. But teachers do, on the average, work hard and deserve to be well-compensated. I had some great teachers growing up, and some terrible ones. The union protects the good ones and the bad ones. I’d say this is also problematic but remember: school administrators are all teachers, and usually the most politically adept ones, so most are grossly incompetent at being good managers. The good teachers probably face a disproportionate amount of their VP/Principal/Superintendent incompetence as they attempt to innovate, make their schools better, etc. I couldn’t agree with you more Joe, I’d say the market is completely distorted. Luckily I want to live and work in a rural area, so that is a major advantage when it comes to a job search. It is nearly impossible to get a job within 500km of the GTA from what I understand. Interesting view Beardie. I recently wrote an article over on my site talking about how technology may soon be so good, that a completely different delivery model might make us obsolete in ten years or so. Teachers work really hard. I am the daughter of a teacher and married to one. 9-5 doesn’t exist or a free full weekend. Teachers also bring it home with them. I leave my office and I am free! Also, kids aren’t getting any easier to deal with. Classes of 30-40 students are a lot to deal with. Good for you for being a good teacher and for your side gig. Anyone that tells you teaching is easy lock them in a room with 30 grade sevens and see if they come out alive! I do 30 grade 7’s everyday MP… I hear you! Class sizes really are a huge deal. For me, anything over 25 is exponentially more stressful, and the marking really starts to pile up as well. I can really see a difference in one-on-one attention if I get under 21-22. I’ve always considered teaching when I get some experience in my field and if I end up doing grad school. Of course, I wouldn’t want to teach children or teenagers, just college. But it’s a good gig for college, my teachers all make good coin. The only problem is trying to find a job Daisy. I looked into this as well… it can be very difficult in many subject areas (stupid history addiction). As a teacher in the states, it is different depending on the school and subject. I used to average 60-70 hours a week when I was a CFO. Teaching requires much less, but can be more exhausting. If I weren’t a teacher, I probably would not be a blogger or any other side gig. This is a great illustration of what being a teacher allows you, but also the toll it can take on you despite the holidays KC. Thanks for the input. I’m in the process now of a career change after realizing that teaching is something that I love to do. I feel like I’m pretty aware of the pros and cons to teaching, many of which you mentioned, but I don’t think any of them should become a reason to teach. As you said, there are many bad teachers out there, and many of them went into teaching because of the long vacations or the benefits package. The only people who suffer here are the kids. When I was in high school, I had two teachers who I will never forget. They stood out because they cared about their students and wanted the best for them. I want to be the kind of teacher that gets remembered by his students 20 years later. If I get all the perks you mentioned, then that is a great bonus. This is a great attitude E and M. I always say that when it came to choosing the job, the poor teachers impacted me as much as the good ones did. I figured that if I wanted to change the world, and really interact with people in order to make a difference, I should start in schools where there was so much negativity going on. It’s refreshing to see a teacher acknowledge that teachers do in fact have it pretty good! I have a few teacher friends and are envious that they’ve been able to spend their summers travelling… Or that they don’t have to worry about childcare during Christmas break, March break and summer vacation. I do know that it can be downright difficult to secure a permanent teaching job though. So many new graduates end up spending years as a supply teacher before being able to secure their own spot. I try to gently remind my co-workers that we have it pretty well, but it doesn’t go over great sometimes. My dad grew up running his own logging business. Compared to handling a chainsaw 12 hours a day, teaching is pretty good, no matter how much work report cards take. Very interesting post! My Dad is a retired teacher and my friend is currently one. Teacher do definitely get a lot of time off – but if you are a caring, hardworking teacher, it’s a tough job, and you are worth every cent you’re paid. Even if you don’t want to start up your own business, you can pick up extra hours elsewhere – e.g. my teacher friend worked at the LCBO over Christmas break! This is what some teachers don’t seem to understand MCB. If want to earn an extra 10k a year it really isn’t THAT difficult. I mean, I don’t have children, but I am pursuing a masters degree and operating a growing small business, so I know it can be done. I’m a part-time teacher. Between the preparation and marking assignments, I sometimes get a bit stressed. It’s all worth it though, because my students are also my friends. And I enjoy the feeling of satisfaction when my class understands what I’m teaching. I’ve been a sub-teacher for years now (currently looking for a full-time position) and I love what I do. AND, I also love the schedule. I do all the prep-work needed to make sure my lessons are creative and engaging and the students learn something from it, but getting home by 3 or 4pm and having plenty of time off for spring, summer, and winter break accommodates my side blogging income terrifically. I work hard and solely focus on teaching when I’m on campus (and sometimes off if planning a special lesson), but off campus, I can pursue other interests. Isn’t it great Little House? There is nothing wrong with just admitting we have it good and being extremely thankful for it right? I’m glad to hear this is harmonious… maybe too harmonious. I think I’ll have to write a post on how much a teacher is really worth. Those of you who are good, deserve every penny you get, and then some. I loved being one for around 10 years before I decided to change course. When I look back I really miss those respectful relationships between me and my pupils. Those are the moments that I love to cherish, it does give in an amazing sense of humility. Teaching was never just reading and imparting knowledge but it helped me to build in a bond of friendship with many in and around college. If I get a chance ever again, without giving a second thought I would grab it, even it was spending just an hour doing so. Would be interesting to see what would happen if the unions and government got dropped and let the free market dictate the wage (and benefits) of teachers.